In almost any rant calculated to justify any government violation of a natural human right (especially those specifically mentioned in the Bill of Rights; in particular the right to own and to carry weapons) someone will invariably bring up the belief that rights can be limited because “you can’t yell ‘FIRE!’ in a crowded theater”. This belief is based on one Supreme Courtjester's tired old lie, used to justify another lie. 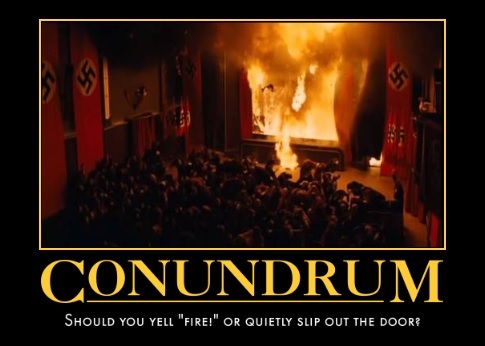 Yes, you actually can yell ‘FIRE!’ in a crowded theater, especially if it's on fire. The actual historical statement asserts you have no right to falsely yell “FIRE!”, but almost everyone misses that distinction, either through ignorance or by design. And it is still wrong anyway. It is your absolute human right to say (or write) whatever you want to say. It may not be wise, and in a free society you will be held accountable for any harm you cause by doing so. You have the responsibility to NOT say something untrue which can cause trouble, but no one has the right to silence you. Most people suffer from a tragic misunderstanding of where rights come from. I’ll give you a hint: they don’t come from government or any of its documents. The Bill of Rights doesn’t create any rights at all. In fact, it doesn’t even apply to you or me at all unless we work for government. And for those to whom it does apply, its entire purpose is to stop them from violating the rights of individuals. That's right: the Bill of Rights is simply a “government shall not…” list and a warning that government has no "right" (governments can't have rights) to violate natural rights. It makes doing so a crime. Government is thus prohibited from enacting “laws” that violate natural rights by the very document which foolishly created it and "allows" it to exist. Since the First Amendment places ALL speech beyond government regulation or control (among the various things it prohibits government from doing), it makes no exception for things that can be destructive or stupid. So, say what you want to say, after you've weighed the consequences and decided whether they are worth it, then face the consequences like a self-owning human being should.